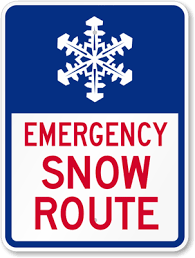 BUS RIDERS: Please review the bus numbers and pick-up times/places we will use IF utilizing Emergency Snow Routes. We DO NOT plan to implement this tomorrow (1/23), but want you to be aware for possible future needs. The following bus stops will be utilized only in the case of emergency conditions for which it is necessary to limit bus routes to hard surface roads. The list includes approximate times buses will stop at each designated location.